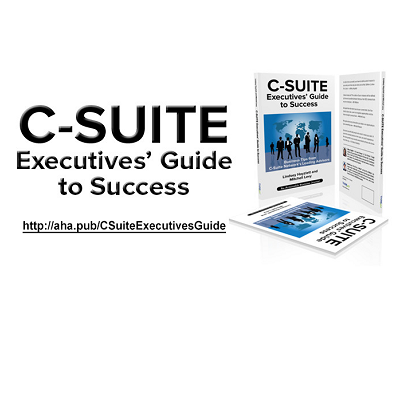 This week’s five AHAs are from the AHAbook™ C-Suite Executives’ Guide to Success. Please share this URL “aha.pub/CSuiteExecutivesGuide” in your social media status update to let your friends know about it. The Kindle version of this amazing book can be downloaded for FREE today until December 7th (Fri). Don’t miss the opportunity to pick up this great content: https://amzn.to/2BDzWoC. C-Suite Executives have a lot to deal with every day—from being the rainmaker of their business to effectively leading the people in their company. Due to their overwhelming duties, there will be times when they get stuck. It’s not easy being a C-Suite Executive; they always need to be at their best. However, they are only human, and there will be times that they need all the help they can get. 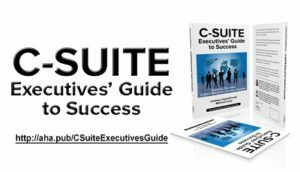 C-Suite Executives’ Guide to Success is part of the THiNKaha series, whose slim and handy books contain 140 well-thought-out AHA messages. Increase your online influence by picking up AHAthat, and easily share quotes from this book on Twitter, Facebook, LinkedIn, and Google+ via this link: http://aha.pub/CSuiteExecutivesGuide. Hey, Did You AHAthat? If not, you should. Get your free account and start sharing in seconds: AHAthat. To stay informed of future posts, please scroll to the top of this post and follow me.